Shop local, but shop smart by knowing how and where to find the best deals. Shopping economically at your local farmers market requires two things: restraint and knowing how to run the numbers on the fly. I could hear my husband choking on his locally roasted coffee from the next room as I wrote that sentence. 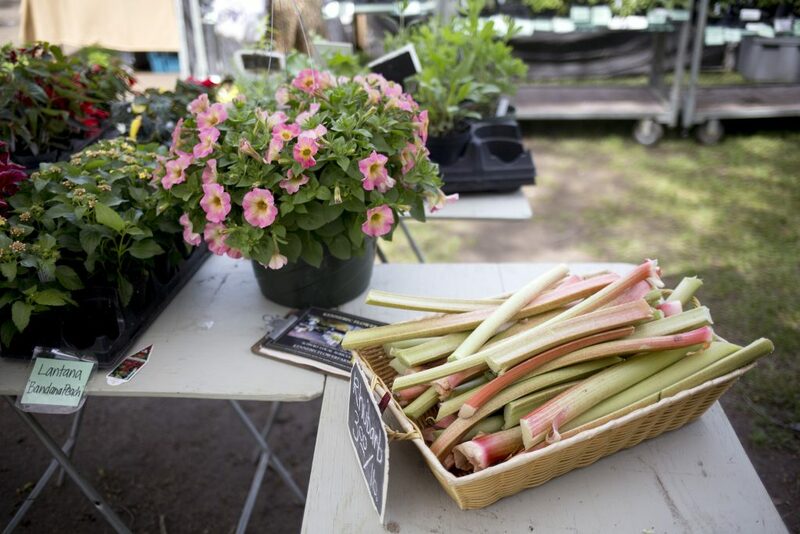 He balances our virtual checkbook and knows, full well, that I lack a sense of economy when faced with beautiful local bounty any time of year, let alone when the outdoor farmers market season is in full swing. At this time of year, my wicker market basket and my wallet get stretched to their outer limits. Luckily for my children’s college savings accounts, I do know a few folks who have, use and are willing to share their many skills for making a middle class food budget stretch to accommodate all the local fare they can consume, week in, week out. 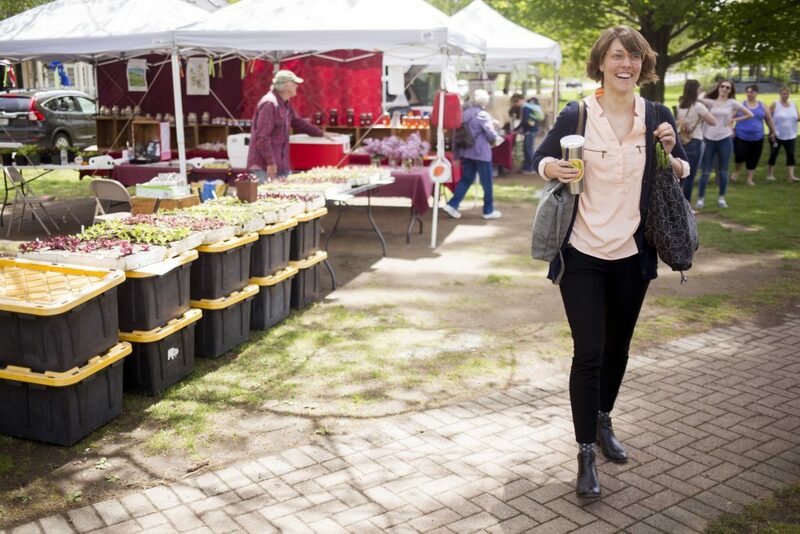 I’ve assembled their collective top 10 tips and tricks for shopping at any one of Maine’s 115 independently coordinated farmers markets without breaking the bank. 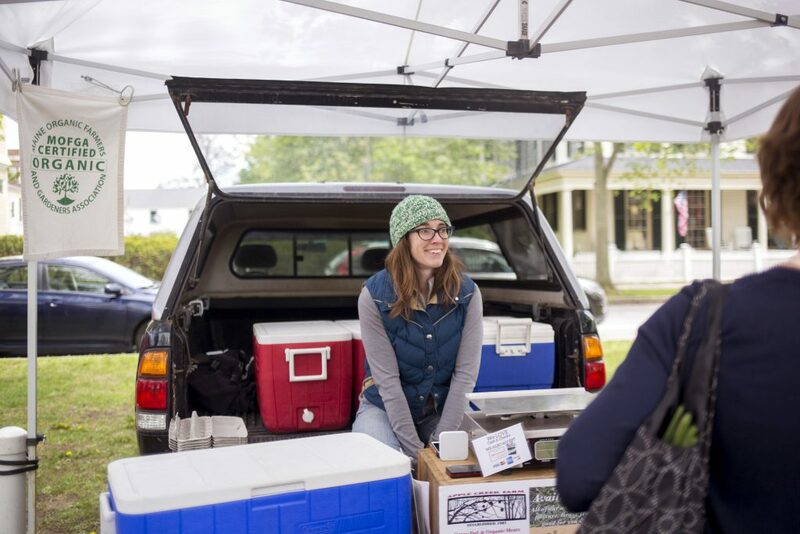 “Farmer’s market pricing is complicated by the fact that every farmer assesses what they are going to charge for their produce differently,” says Heather Ormand, organic marketing and business coordinator for Maine Organic Farmers and Gardeners Association. It varies based on the products and the amount of them they’re selling, as well as their individual costs, and what the markets they participate in can bear. Three theoretical pricing models are usually in play, though. Market research pricing is when a farmer examines what the farmers in the stalls around him are charging and sets his prices to compete accordingly. Ormand doesn’t advise farmers looking to sustain their livelihood to employ this method exclusively because it doesn’t factor in a farmer’s actual, individualized costs. Value-based pricing is when a farmer changes his pricing based on market demand. Under this scheme “first of the season” produce – asparagus, berries, sun-ripened tomatoes, corn, whatever you fancy – commands a very high price when it first make an appearance in low quantities and then evens out as supply can keep up with demand. 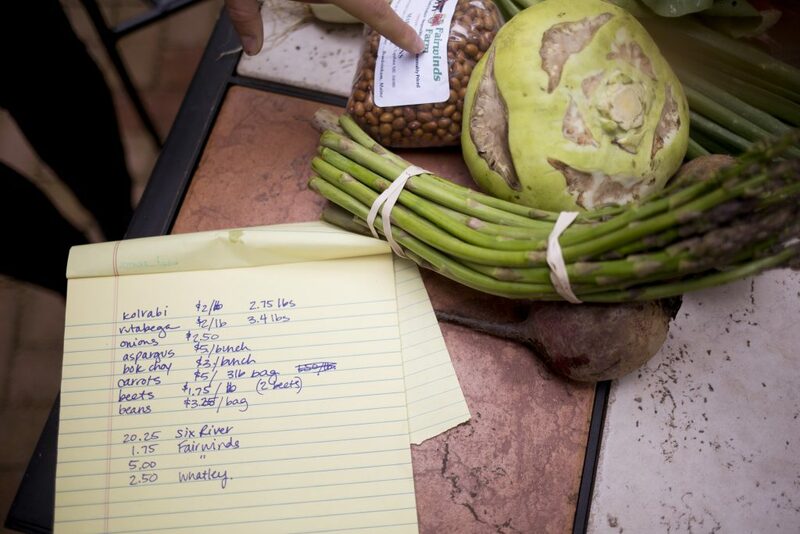 Ormand acknowledges that many farmers use this technique, but she explains that keeping track of how much produce is moved across weeks and months becomes an accounting hassle. Ormand says Cost Plus Pricing is the model that best matches a farmer’s cost of growing food with her revenue. For it to work correctly, a farmer must have a strong handle on production costs and then must set prices to cover those costs plus provide profit that amounts to a living wage. 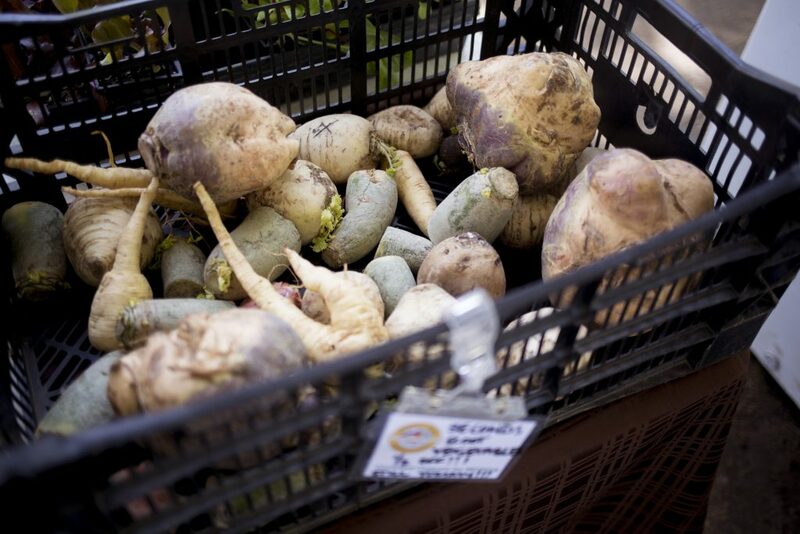 Under this scheme, buyers can expect to see a set price on produce that does not fluctuate much over the course of the season. Regardless of how farmers set their prices, whether farmers market produce costs more or less than that sold at grocery chain stores or independently owned cooperative markets varies by product, Ormand said. 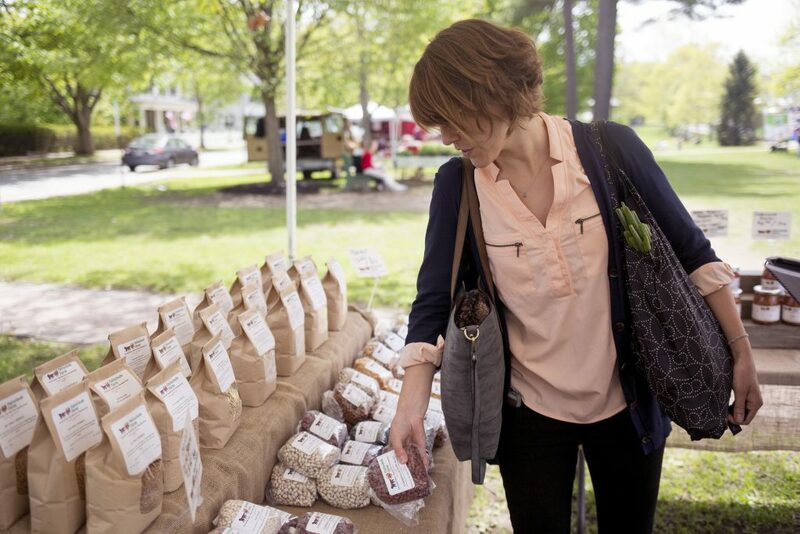 She is running a study that compares the price of local and organic produce in all three venues in Maine. 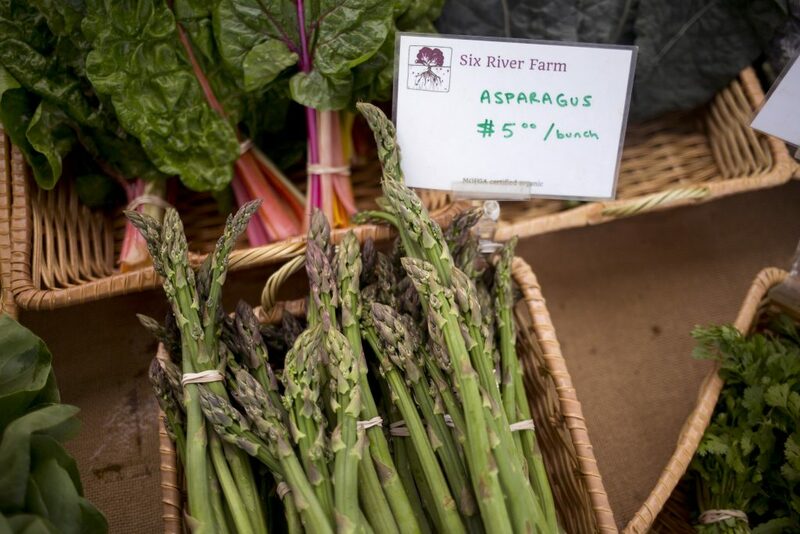 The study was initiated earlier this year by Maine organic farmers who believe pricing has stagnated in recent years despite rising production costs. Ormand’s full report will not be released until November, after the outdoor market season concludes, but she shared some early data for this story. In late April, in the midcoast Maine sample, organic local cabbage cost $1.50 per pound in the farmers market, $1.89 in the independent cooperative market, and $2.29 in the regional grocery store. Organic local onions were $1.50 per pound at the farmers market, $1.33 at the local cooperative, and $2.29 at the grocery store. Organic, local salad mix cost $12 per pound at the farmers market, $12.77 at the independent cooperative market, and $9.31 at the grocery store, although it was not locally sourced for that price. Tracking these numbers is part of Ormand’s job and she has a team of volunteers who help her collect data. 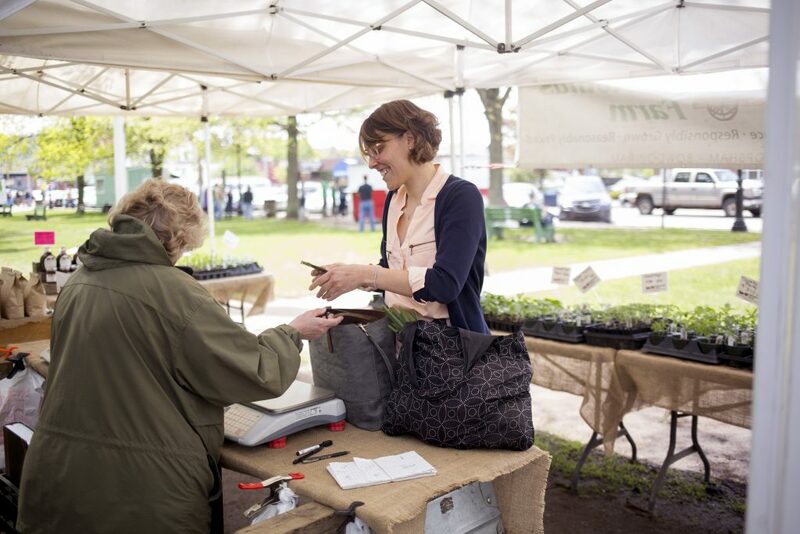 But she suggests that all shoppers interested in stretching their farmers market dollars conduct micro-studies of their own once or twice a year to see where it makes the most sense for them to buy their go-to produce items. She makes mental notes of the least expensive produce on offer (by pound) in each stall and then compares those prices across vendors. This can get tricky at the market because some farmers offer products by the pound, while others sell them by bunches, bags or quarts. She doesn’t break out her wallet until she’s done this analysis and then she makes actual notes of what she bought, in what amounts, for what price, a practice that both helps her curb spending and prevents her from buying what she can’t store, cook and eat in the next 10 days. Gerken knows which farmers offer certified organic produce, employ sustainable farming techniques but are not certified, and those who practice more conventional farming. She says the price differential between organic and conventional is obvious, but she shies away from making nutritional value judgments among the products based on how they were grown. “I want people to eat more fresh fruits and vegetables. They have to decide for themselves how much they can afford to pay for them and set their own priorities for sourcing them,” Gerken said. 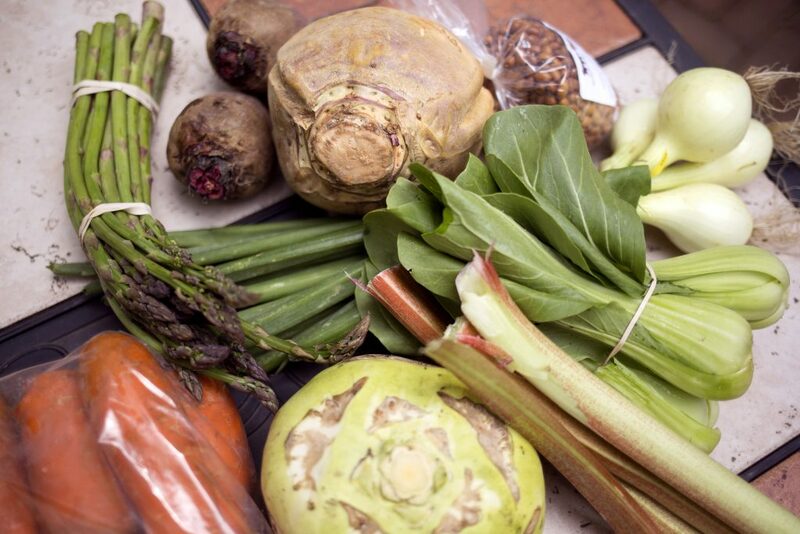 Don’t be tempted by the first of anything to appear at the market in any given season. First off, they are not always the tastiest. Next, they will regularly be the most expensive. (The happy corollary? 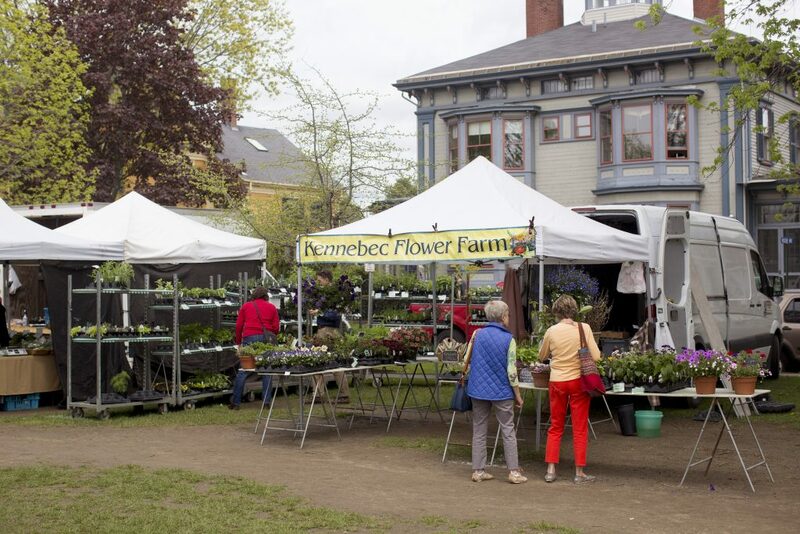 There are many great bargains when an item is in peak season, says Leigh Hallett, executive director of the Maine Federation of Farmers’ Markets.) Waiting is easier said than done. After the cold, rainy spring we’ve had, I will have to sit on my hands to prevent myself from snapping up the first sun-ripened tomato I see! I am told that I am one of the luckier shoppers in that I routinely see boxes and bags of “seconds” on offer at the Brunswick Farmers’ Market I frequent on the town mall on Tuesdays and Fridays from early May through Thanksgiving. Seconds are less than perfect-looking produce that is sold at a pretty decent discount. But even if you don’t see seconds on farmers market display tables, it’s worth developing a relationship with the farmer who sells you her firsts in order to ask, successfully, for any seconds held out of sight. Once your farmer knows your face – no guarantees on remembering names – the opportunity of exploring your relationship further is wide open. Make her well aware of your penchant for pickling so she can keep you abreast of a future deal on what promises to be a great cucumber season, for example, Hallett explains. The communication channel you build with your local farmer could end up being priceless, so to speak. 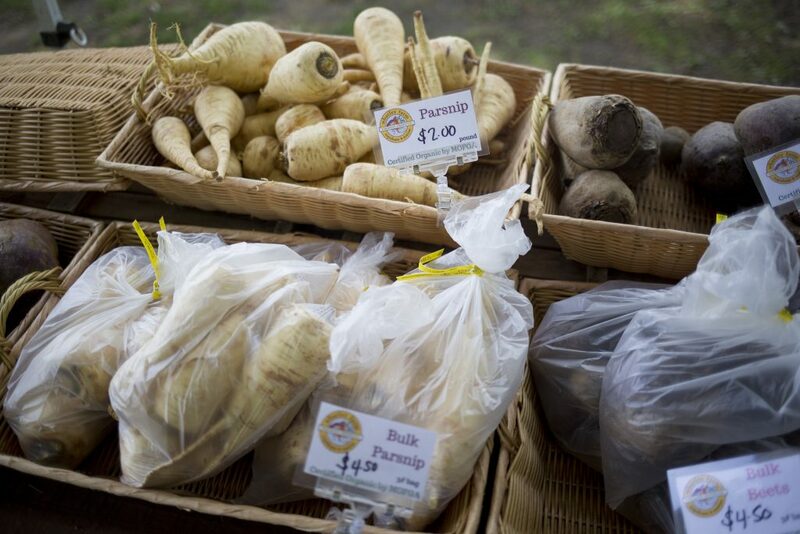 Last week at my market, I saw that parsnips were selling for either $2 for one pound or $4.50 for a bulk pack of 3 pounds. Obviously, the bulk buy would be a great deal, if, in fact, I had room in the refrigerator to store them properly so they would not go limp and dry, or the time in my schedule to make a big batch of soup to freeze for future use. I had neither, so the frugal buy was a single pound that could be roasted for dinner that night. I’ve waited in line at a farmers market to buy vegetables, bread and even cheese. But I’ve never had to fight the crowds to buy pastured proteins. Yes, they are more expensive than grocery store variety chicken, beef, pork and lamb. But they are more flavorful, more sustainable and raised humanely so you can eat with an easy conscience. Start with a whole chicken. When you pay $13 per pound for boneless chicken breasts, you’re paying for convenience. If you spend $6 per pound for a 4-pound bird that includes two pounds of dark meat and a carcass for soup, it’s almost like getting the breast for free. Gerken regularly picks up the local dried beans on offer at farmers markets because at $3 to $3.25 for a 2-pound bag, the fresher, local beans – which tend to cook up creamier than those that sat in a grocery store warehouse – come pretty close in price to their supermarket counterparts. She knows to select the beans that swell to the largest size when cooked, yellow-eyed beans on the day we shopped together, to give her more protein bang for her buck. 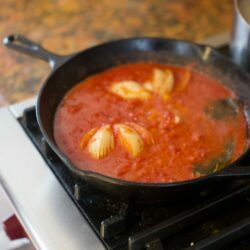 She fixes a big pot of beans on the weekend and mixes the cooked beans into all sorts of meals between trips to the market as a perfect protein addition to her vegetable-forward meals. 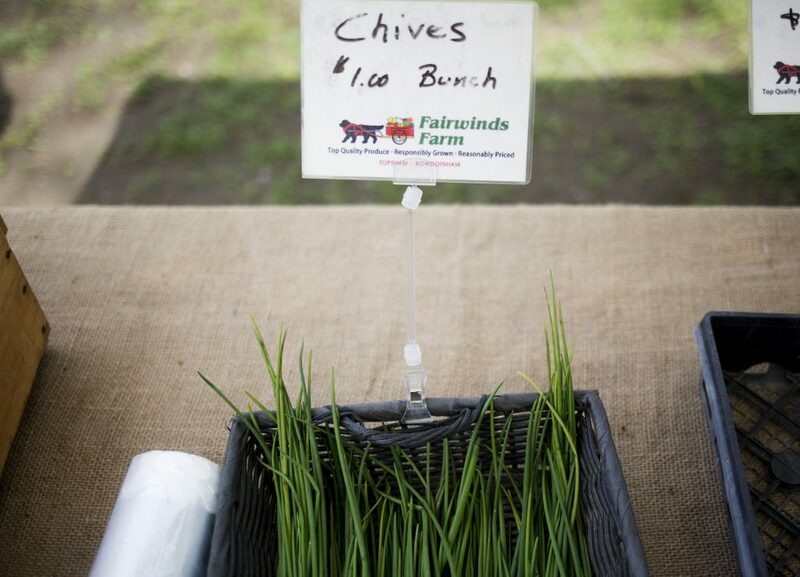 Sure, you can buy the last of the foraged fiddleheads, a head of garlic, some hard cheese and a pumpkin. 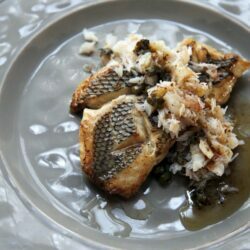 Clean and blanch the fiddleheads, peel and chop the garlic, grate the cheese and fish out the pumpkin seeds to toast them before throwing everything into the food processor with olive oil. Or you can go to the Falmouth Farmer’s Market on Thursday afternoons, buy Fiddlehead Pesto from Valley View Farm for $4.95 and toss it with warm pasta. Voila, dinner. When time is money, consider value-added products made from local ingredients to be cost-saving devices. Every seasoned thrifty farmers market shopper I know walks away from the expensive, not absolutely necessary thing they would likely really enjoy on the way home. Be it a box of raspberries, a still-warm, savory hand pie, or a bouquet of fragrant flowers, buy it. Because the taste memory elicited from that splurge will bring you back around to the market, even if it takes a little more effort not to break the bank when you’re shopping there. CORRECTION: This story was updated at 4 p.m. on June 12, 2017, to clarify the remarks of Leigh Hallett regarding “first of season” selections.